The article for today is written by Joey Hickey. Joey writes about the idea of loving Jesus, but not the church. This is a popular sentiment among many people today. Joey shows us that that notion is impossible. Thanks for the article, Joey. One of the most popular sentiments among my generation is, “I love Jesus, but don’t love religion.” They contend, “as long as you have a personal relationship with Jesus, you don’t need religion.” As far as I can tell, they’re really saying, “I love Jesus, but I don’t love the church.” The idea of not needing the church seemed odd to me, after reaping the benefits of growing up in the church. In all honesty, everything I know about Jesus I owe to being a member of the Lord’s body (the church); without the church, I would know little to nothing about Jesus. The other day, I stumbled across a video where a man claimed, “Jesus hated religion.” This is not the picture I get when I read passages like Ephesians 5:22-33, where the Bible compares Christ and the church to a husband wife relationship, and says, in verse 29, “For no one ever hated his own flesh, but nourishes and cherishes it, just as the Lord does the church.” The assertion that Jesus hates religion goes against the command to pay attention to “the flock” and “to shepherd the church of God which He purchased with His own blood,” in Acts 20:28. Why would Jesus hate his wife if he commanded each husband to love, nurture, and cherish his wife? (And what kind of husband, for that matter, would want to have a very personal relationship with someone who claimed he or she hated his wife?) Why would Jesus buy (purchase) or die to preserve something that he hated? Why would the Holy Spirit, through Paul, devote 31 verses of 1 Corinthians 12 to the importance of the church and each of its members, if the church wasn’t necessary for spiritual growth? If we really dig in to the core of their argument, the real issue is accountability. We don’t like to own up to our sins…Or at least I know I don’t! It’s embarrassing, even scary, to admit our mistakes. Among a body of believers who seek to put Acts 20:28 into practice, people will be seeking to know how I am doing spiritually. However, the Bible commands us to confess our sins to receive God’s cleansing from unrighteousness and forgiveness of sin (1 John 1:9, James 5:16). I confess that it is not easy to confess my sins. These scriptures aim to teach us the importance of not only being accountable to God, but also to fellow members of the body! This aspect of Christianity is non-negotiable. If we practice pure religion, what’s not to love? The article for today is from Carter Culbertson. Carter discusses the subject of lying. This is a sin that is prevalent in our world today. 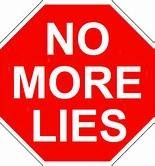 The more people lie the easier it becomes, but as Carter points out liars will not be able to enter heaven. Thank you Carter, for the excellent article. ​Chances are you’ve been lied to in the past day or two, and that’s something you and I have to deal with. I go to school every day and probably 90% of the people I know, lie. It seems some of them are compulsive liars. Just like anything else, it is very tempting to lie and cheat. I often wonder what benefits people get from cheating. Yes, you many get away with it, but your conscience will bother you and it’s hanging over your head all the time. You may think you can get away with it, but as we always say, even if no one finds out, God knows. The article today comes from Colby Culbertson. In this article Colby talks about the hypocrisy that often exist in the lives of many Christians. ​As the days of our lives tick by, it can be easy to let ourselves slip sometimes without even realizing what is happening. With this being the case, we must be on guard for subtle sins and temptations that can sometimes overtake us without us realizing it. I can’t think of a better example for myself and every other Christian who still wants to live correctly in God’s eyes to notice than the Pharisees that Jesus called hypocrites in Matthew 23. Verses 27 and 28 say this: “Woe unto you, scribes and Pharisees, hypocrites! for ye are like unto whited sepulchres, which indeed appear beautiful outward, but are within full of dead men’s bones, and of all uncleanness. Even so ye also outwardly appear righteous unto men, but within ye are full of hypocrisy and iniquity.” The Lord uses an interesting simile here when he describes the Pharisees and scribes as whited Sepulchres. He says that they appear beautiful outwardly, but within are full of dead men’s bones and all uncleanness. This would be like buying some bananas that appear perfectly ripe at the grocery store, but after peeling, there is a brown mush on the inside. What does this mean? The Pharisees didn’t live what they taught…they were hypocrites! Hypocrisy was the downfall of the Pharisees and it will be the downfall of the church today if we don’t guard against it! It is so important to practice what we preach and believe. As we have said, hypocrisy, although a big thing, can be subtle. In other words, sometimes we get caught up trying to live everybody else’s life and tell everyone else what the Bible teaches while neglecting our own lives and living any ol’ way. Too many times we’re just like the Pharisees, full of hypocrisy and iniquity within. It’s past time we cleaned house on members of the church who break out their “Sunday best” on Sunday morning, but are as corrupt as corrupt can be Monday through Saturday. As long as we have members like this, our hopes to convert lost souls to Christ will be futile, because whatever progress is being made in converting a lost soul is at the same time being undone by hypocritical “Christians”. Brethren, if the church is going to continue to stand in the future, we must become the type of Christians who are whited sepulchres–both inside and out. The article for today is from Sean Smith. Sean is 18 years old and lives in Tampa, FL. We want to thank him for his willingness to write and commend the article to you. Ecclesiastes 12:1: “Remember now thy Creator in the days of thy youth, while the evil days come not, nor the years draw nigh, when thou shalt say, I have no pleasure in them;” In this verse Solomon gives great advice to the young. Solomon hopes to reach the hearts of the young. He does not want them to forsake God. Solomon in all his wisdom said “to fear God and keep his commandments for this is man`s all,” (Ecclesiastes 12:14). We have seen many men abandon the faith. Paul records one who forsook him because of his love of the present world: 2 Tim. 4:10.” For Demas hath forsaken me having loved this present world.” Love of the world is a danger to all men, but the young can be particularly affected by the world. When you are with your friends of the world, do you remember God or do you forget Him? The young need to remember the Creator now. If they remember the Creator in their youth, they will be able to lean upon God in the future years when the evil days come. There is nothing Satan wants more, than for us to be lost. He will try to persuade the young to forsake God. The opposite of remembering is to forget. Perhaps you have had the experience of being told by your parents or teachers to remember something, but you forgot. It probably was not a pleasant experience. Forgetting God will lead to unpleasant experiences. If you have forgotten God, you need to come back to God. Remember him again. To call yourself a Christian, and forget God in everyday life is wrong. The young need to make their commitment to God sound. The race we have entered is not a race of speed, but a race of endurance. We have but one goal, winning the race; one prize – heaven. The only way to win is to remember and obey God. This is our second article from Aaron Battey. Thank you Aaron for reminding young men and women about these qualities that they should develop in their lives. Titus 2:4-8 reads as follows: “Admonish the young women to love their husbands, to love their children, to be discreet, chaste, homemakers, good, obedient to their own husbands, that the word of God may not be blasphemed. Likewise, exhort the young men to be sober-minded, in all things showing yourself to be a pattern of good works; in doctrine showing integrity, reverence, incorruptibility, sound speech that cannot be condemned, that one who is an opponent may be ashamed, having nothing evil to say of you. In Titus 2:4-8, Paul does not give an exhaustive list here of those things the young must perfect. Rather, he gives an outline for the reader to complete through study of the Word. For example, to the young women, Paul says to be chaste or pure (v. 5). What things are pure? Further reading of the scriptures will enlighten a sincere reader that modest dress, a righteous tongue, abstaining from drinking parties, and much more fit this description. To the young men Paul says to be sober minded (v. 6). This includes a literal sober mind, free from intoxicating substances, but the definition does not end there. Avoiding youthful lusts, contemplating on spiritual matters, and other such righteous behavior fall under this category. Paul’s words to Titus are for young people of every era. If we perfect these qualities at a young age, then we will not require rebuke at an old age like the Hebrew disciples in Hebrews 5:12, “For though by this time you ought to be teachers, you need someone to teach you again the first principles of the oracles of God.” Spend time in Bible study expounding on these qualities, “That it may be well with you and you may live long on the earth,” (Eph. 6:3).